As simply as can be stated, the Chevy Small Block is a self-perpetuating marvel of automotive history. The very excellent design of the engine, the solid advancements Chevy continuously made and the sheer prolific nature of the motor made them rise quickly to the top in the world of engine swapping into Jeep vehicles. In 2000, Ward's voted it to be one of the top 10 engines of the 20th century. 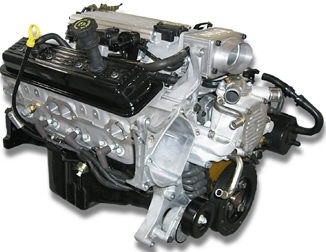 90,000,000 Small Block Chevy engines have been built up through 2004. They have evolved into Generation II and Generation III engines. However, the Generation I Small Block remains in production and successfully sold under GM Powertrain's popular crate engine program. A complete SBC can be built today in a thousand different variations from purely aftermarket manufacturing sources. Especially in today’s incarnations, the Small Block remains a very exciting and doable swap into a Jeep. By contrast, some of the other auto makers did what they could to make their engines (and associated control systems) complex for complexity’s sake, GM chose the route of solid engineering that the end user could modify, tweak and configure to work in a variety of situations and vehicles. What’s more? They fit - where other motors would not, and with a host of aftermarket companies supplying many components and modifications that facilitate Small Block swaps, the end result is a much more feasible, sanitary and well documented conversion. In the fifties & sixties, the stage was set like this: people had Jeeps they loved, which had engines they did not. Simple popular interest soon propelled the V8 into the forefront of a burgeoning hobby of “engine swapping.” Jeeps were amongst the first recipients of these motors. One writer on this topic in the early 1970s estimated that there were upwards of 60,000 Jeeps that had been swapped to Chevy or Buick power. We don't know where he got his numbers, but it is hardly inconceivable. In thousands of conversations by phone and mail, we regularly and invariably get the question, “Why Chevy power? Why do you not push Ford and Mopar conversions as much as GM swaps?” GM swaps are, very simply, what so many people are asking for, and in increasing numbers. Since the late fifties, Chevrolet power has found its way into nearly any vehicle with wheels. Everything from MG’s, to Jeeps to motorcycles. So much so that it is even understood on the popular level, as evidenced by an episode of the television show Home Improvement, where Tim Allen proposes putting a Chevy 350 into the vacuum cleaner. GM swaps promote themselves because they are so good for so many reasons. Take it or leave it, most swappers will get more value for their money and time with a GM swap because they are well documented in literature, well supported in parts and they often make very good mechanical sense. As early as Chevrolets were on the road, they were developing a reputation as cars with an edge on performance. Chevy’s first V8 was actually introduced in 1917. It was a 90 degree, overhead valve engine. It was produced for only two years - as Chevy got into four and six-cylinder power instead for the “smaller” cars they were then producing. Cadillac probably started the horsepower war when it introduced its new V8 in 1949. However, Chevrolet would soon bring it to the popular level. In 1955, Chevrolet introduced the Small Block V8, so called because of its compact design. This first V8 featured 265 CID of displacement and produced 180 hp (some sources claim 195 hp). As would become typical in Chevy automotive history, this V8 was first rolled out in the Corvette, which had been criticized somewhat for its prior, less-than-exciting I6 offering. The new V8 engine was an intelligent design, combining performance, durability and manufacturing affordability together. The skirt of the engine was short, the casting was thin-walled for weight and material savings, and the valvetrain was simple and effective. The Small Block soon became known as the “Mouse” motor, following its reputation as a light, compact powerhouse. The motor was an instant and popular success, taking the automotive world by storm. Within a few years, nearly every American automotive company - from Ford to Chrysler to AMC to GM's Buick, Olds and Pontiac divisions - would follow suit with compact, performance oriented V8 engines. The horsepower wars were now alive and well, and engine swapping, building, tuning and hot-rodding became one of the coolest and most pervasive pass-times in America. By 1957 the Small Block was delivering 283 hp - one HP per cubic inch. It was fitted with mechanical fuel injection for the Corvette only. While horsepower was up, this nascent fuel delivery system was regarded as not yet fully refined. Chevy V8's have come with stock displacements of: 262, 265, 283, 302, 305, 307, 327, 350 and 400 cubic inches. Other variations exists within performance and aftermarket circles. The height of the muscle era saw Small Blocks delivering glorious amounts of power. The fuel crunch of the early seventies saw much of that progress wane as motors were de-tuned, saddled with ever more complex carburetors, emissions systems and other restrictions. As the Small Block entered the '80s, they reached their peak in ancillary complexity, though the same basic design remained the same, and they still enjoyed a level of reliability and serviceability that kept them popular. As GM struggled to maintain its CAFE ratings, more aggressive and intelligent engineering spawned the mainstream advent of throttle body fuel injection, and just at its heels, the tuned port injection systems. Computer controlled fuel, spark and other systems began to take hold and significant power and economy strides were made simultaneously. These TBI engines hit their stride in 1987 as the engineering refined. Chevrolet V8’s built from 1955 through 2005 were of the Generation I or I+ designation. Even though these motors were throttle-body and multipoint injected since the mid-eighties, they were still based on the same block design. 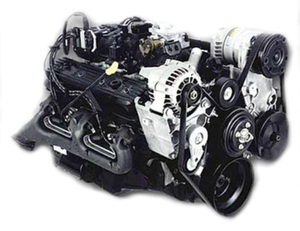 These engines were produced simultaneously with their progeny, the LS and Vortec Generation III engines, and used in GM truck applications, as well as continued marine and crate engine production. The last regular production option 350 Vortec V8 was produced through 2003 and the motor had acheived a maximum in its engineering and performance with 43 great years of improvements. The LT1 was an exciting and evolutionary engine that pointed toward GM's iminent Gen III engines. 1992 saw the introduction of the LT1 in the Corvette. Chevrolet entered the Generation II era. These engines featured aluminum heads, reverse flow cooling (cooling the heads first, in lieu of the block), and advanced electronic controls. However, these motors were still generally based on the classic Small Block design. The block-to-bellhousing bolt pattern was the same, as were engine mounts excepting the passenger side mount bosses, which were oriented in upside-down fashion. Versions were available with cast iron or aluminum heads. The LT1 (and subsequent LT5) evolved into the kind of modern powerplants we see produced today. Features included: crank position sensors, mass airflow sensors, additional O2 sensors (largely for OBD-II compliance). Electronic transmissions are typically paired or pulled with the same year of engine and PCM. PCM controlled engines getting a non-electronic automatic transmission should have their PCM programmed as if paired with a manual transmission. Of course, the mechanical history of the Chevrolet V8 motor is much richer than this synopsis, and we do recommend more research and reading for the enthusiast. However, as there are some important mechanical details that are pertinent to Chevy Small Block swaps in Jeeps, we have created some valuable interchange information. GM's Generation III engines are such an advance, we've created a separate section for them.